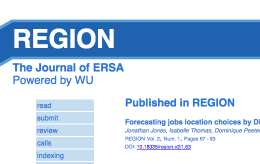 REGION, the new open access journal, is a joint initiative by ERSA (European Regional Science Association) and by WU (Vienna University of Economics and Business Administration). The initiative is supported by seed funding from FWF (Fonds zur Förderung der wissenschaftlichen Forschung). REGION will publish top-quality, peer-reviewed articles in Regional Science, Regional Economics, Economic Geography, and related fields. In contrast to many other “open access” journals, REGION is free for both readers and authors. By removing all financial barriers the proponents of REGION intend to stimulate the dialog in the Regional Science community, particularly in less developed countries. With a high quality editorial board, a young and enthusiastic editorial team, and the full support from ERSA and WU, REGION is bound to become the flagship journal of Regional Science in Europe.